Figure 1. This 15.32 ct cushion modified brilliant, with grades equivalent to H color and I1 clarity, is the largest HPHT synthetic diamond graded by GIA. Photo by Robison McMurtry. The Carlsbad laboratory recently examined an HPHT synthetic diamond that is now the largest faceted lab-grown diamond examined by GIA. 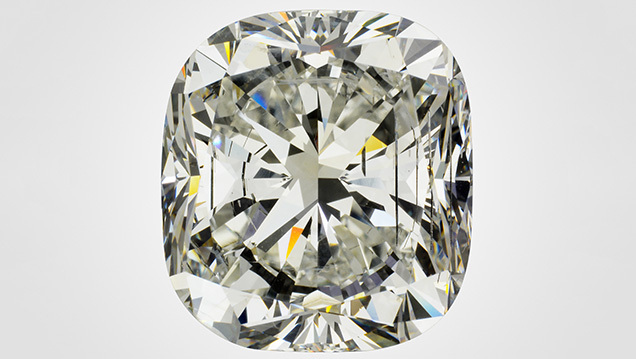 The specimen was a cushion modified brilliant weighing 15.32 ct, with grades equivalent to I1 clarity and H color (figure 1). The largest previously reported fully faceted synthetic diamonds were a 10.02 ct emerald-cut HPHT-grown (equivalent to E-color; Summer 2016 Lab Notes, pp. 195–196) and a 10.08 ct emerald-cut HPHT-grown diamond (equivalent to Fancy Deep blue; Winter 2016 Lab Notes, p. 416). The 15.32 ct synthetic contained large metallic flux inclusions (figure 2) as well as numerous fractures. Examination under crossed polarizers revealed no strain patterns, except for small strain fields around the metallic flux inclusions. Figure 2. The metallic flux inclusions present in the synthetic diamond. Several rod-shaped structures can be seen, as well as an inclusion with a trapezoidal shape. Photomicrograph by Jonathan Muyal; field of view 4.79 mm. Figure 3. Left: This DiamondView fluorescence image of the HPHT-grown diamond’s pavilion shows a combination of apparent layered growth, along with the more common cross-pattern morphology seen in HPHT synthetics. The area of the pavilion shown here also indicates the region of PL mapping. The red arrow indicates the regions that showed a high concentration of nickel, silicon, and NV center defects compared to the remainder of the mapped region. Above this more heavily doped layer is the metal rod inclusion also seen in figure 2. Right: The patterning in the corresponding phosphorescence image closely resembles the fluorescence image. A thin layer of material showing orange (~580 nm) phosphorescence is indicated by the white arrow. The infrared absorption spectrum showed no detectable boron or nitrogen, indicating that the sample was type IIa. DiamondView imaging did reveal blue phosphorescence, which is characteristic of boron impurities (figure 3, right), but any boron present was below the detection level of the FTIR spectrometer. Photoluminescence (PL) spectroscopy taken with the 514 nm laser revealed the presence of the negative silicon vacancy defect at 737 nm; the neutral nitrogen-vacancy center was also seen at 575 nm. The nickel-related doublet at 882/884 nm was seen in the 830 nm PL spectrum. Energy-dispersive X-ray fluorescence (EDXRF) revealed the presence of iron and cobalt which, together with the nickel feature in the PL, gives insight into the flux mixture used to grow this specimen. 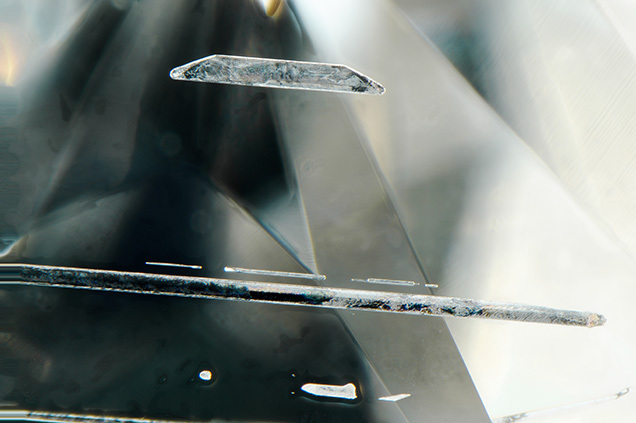 Due to their growth method, HPHT synthetics generally show very distinct growth patterns when examined in the DiamondView. While they can show dramatic differences in fluorescence color, these are generally seen within angular zones that radiate from the center and extend through the volume of the specimen. In contrast, CVD synthetic diamonds are grown as layers. 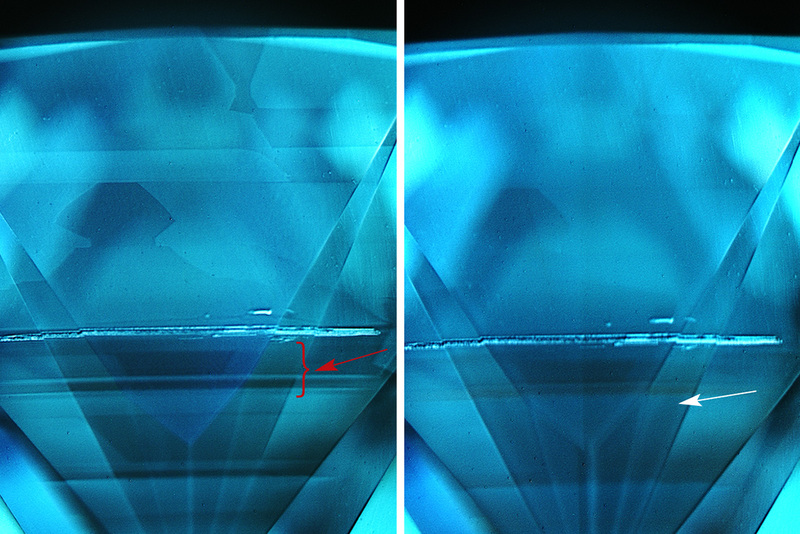 The start/stop events of the CVD reactor result in distinct changes in diamond chemistry that are visible in DiamondView fluorescence images; the changes in fluorescence color are usually parallel due to the layered growth. Therefore, it was quite interesting to see DiamondView fluorescence patterns in which the pavilion section toward the culet far more closely resembles the layers seen in CVD growth than the cross-pattern color zoning often seen in HPHT synthetics (figure 3, left). The fluorescence zoning commonly found in HPHT-grown material can be seen towards the girdle section of this sample. PL mapping at liquid nitrogen temperatures was used to verify the DiamondView observations and detect the distribution of defects through the synthetic diamond (for more on the PL mapping collection technique see L.C. Loudin, “Photoluminescence mapping of optical defects in HPHT synthetic diamond,” Summer 2017 G&G, pp. 180–189). We mapped the PL spectra of the region shown in figure 31 using 532, 633, and 785 nm laser excitations. One of the layers (red arrow in figure 3) in particular showed greatly elevated concentrations of nickel (as the 883/884 nm doublet; average concentration in this area was 5× greater than the average intensity of the doublet in other portions of the mapped pavilion), silicon (as the SiV– defect at 737 nm; 10× greater), and NV centers (NV0 at 575 nm [2× greater] and NV– at 637 nm [2.5× greater]). This particular layer also showed orange phosphorescence in the DiamondView, assumed to be centered at approximately 580 nm (U.F.S. D’Haenens-Johansson et al., “Large colorless HPHT synthetic diamonds from New Diamond Technology,” Fall 2015 G&G, pp. 260–279), in addition to the more common blue phosphorescence. The specific growth process that creates the apparent layers in this HPHT synthetic is unknown, but it may be a necessary condition to grow synthetic material in such large sizes. The manufacturer may use successively larger seeds in separate growth runs or alter the pressure or temperature conditions within a single growth experiment. It should be noted that this growth feature, while layered in appearance, is quite different from CVD growth layers, which have sharp boundaries and are often differently colored. The chemistry collected on the layered portion was consistent with HPHT growth and not CVD growth; the chemistry was also consistent between the layered portion and the cross-patterned portion of growth. Therefore, a CVD seed was not used to grow this specimen. Similar layers were observed in the DiamondView images of the 10.08 ct blue HPHT synthetic (unpublished data). However, the size of this most current specimen demonstrates that the growth technologies and processes are continuing to improve and continuing to impress. Sally-Eaton Magaña is a senior research scientist, and Troy Ardon is a research associate, at GIA in Carlsbad, California. Demonstrates the importance of this method in identifying diamond treatments, based on the analysis of PL maps acquired from a brownish orange HPHT synthetic diamond.